‘Tis the season for dinner parties – and the most delicious party appetizers you can whip up! 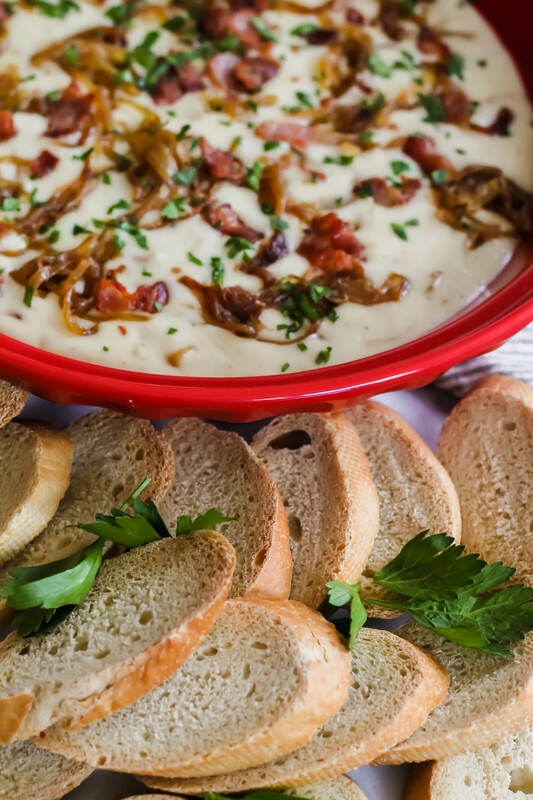 This Brie, Caramelized Onion, and Bacon Dip will become a favorite of friends and family for years to come! I’m partnering up once again with Hood® Cream to show you how easy it is to create a party dip everyone will love. 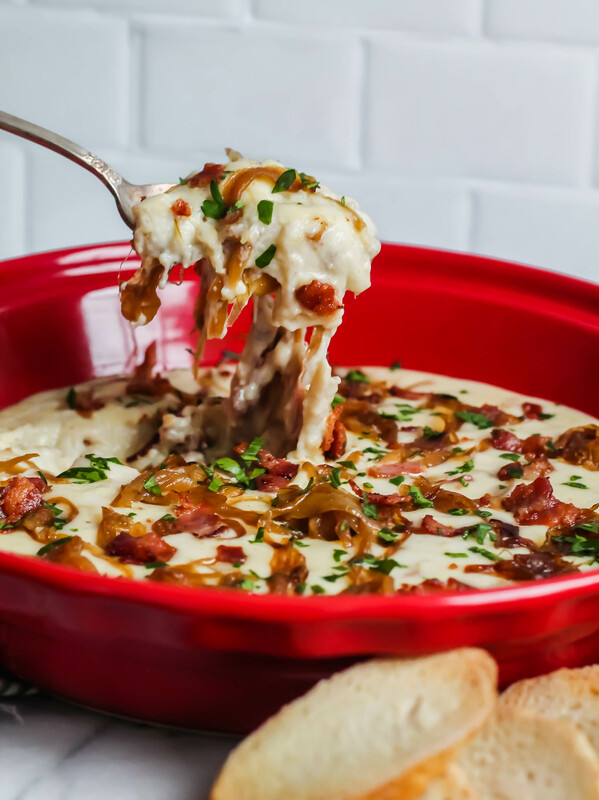 Before we dive into this recipe, I want to warn you: this Brie, Caramelized Onion, and Bacon Dip is hands down the most addictive party dip you’ll ever taste. It’s packed with four of my favorite ingredients: brie cheese, bacon, caramelized onions, and half & half. If you have these four ingredients, you can make this recipe for any of your parties this season! The holiday season – the time that lasts around the last two months of the year, between Thanksgiving and New Year’s Eve, where we host parties, visit friends for dinner, and overall are in the kitchen 90% of the time. For us, we attend a few dinner parties, bake cookies, and then depart mid-December to travel and visit family! Whenever a friend is hosting a dinner party and assigns me the appetizer, I try to bring something that people will love but don’t tend to eat home much. This lusciously creamy and cheesy dip is just that – a recipe I created as I brainstormed ideas for this post. I knew I wanted something creamy to showcase the Hood Half & Half, cheesy because cheese makes everyone happy, and the caramelized onions hit me like lighting because I was thinking about a creamy French Onion soup I had just made the week before. Now, this recipe does have one time consuming step and that’s the caramelization of the onions. I won’t lie – this will take an hour. I’ve seen recipes where cooks say they can caramelize onions in 30 minutes but I wonder what magical onion kingdom they live in?! Impossible, and with this, you don’t want to take any shortcuts. Take the time to sauté them in butter and olive oil, stirring them lovingly every 10 minutes or so over a low heat. They will literally melt and turn a deep, rich dark brown and that’s when you know they’re ready. The best part is you can do this the day (or even a week!) before, and just store them in the fridge until you’re ready to make the dip! In partnership with Hood® Cream, which is the second year in a row that we’ve come together to share the goodness that is HP Hood, this recipe shines and that’s due to the creaminess that the Hood Half & Half adds to the recipe. It’s hands down the best half & half in the market and I love supporting and working with such a family-friendly New England brand. It’s not only the brand I use at home, but the brand we use at the restaurant I work on Martha’s Vineyard – it’s truly the best of the best, and even though they do compensate me for this post, the reality is that I would say that even if they didn’t pay me. It’s just too engrained in my chef life to think otherwise – plus, it’s the best product on the market! Crab Imperial, the perfect appetizer for a plated dinner, combining flaky puff pastry and creamy crab filling. Creamy Milk Braised Short Ribs, a comforting version of a classic, using the Italian technique of braising in dairy. Butternut Squash & Bacon Pasta, a quick weeknight recipe that feels extra special this time of year. plus, my five top tips on Hosting a Delicious Holiday Dinner Party! 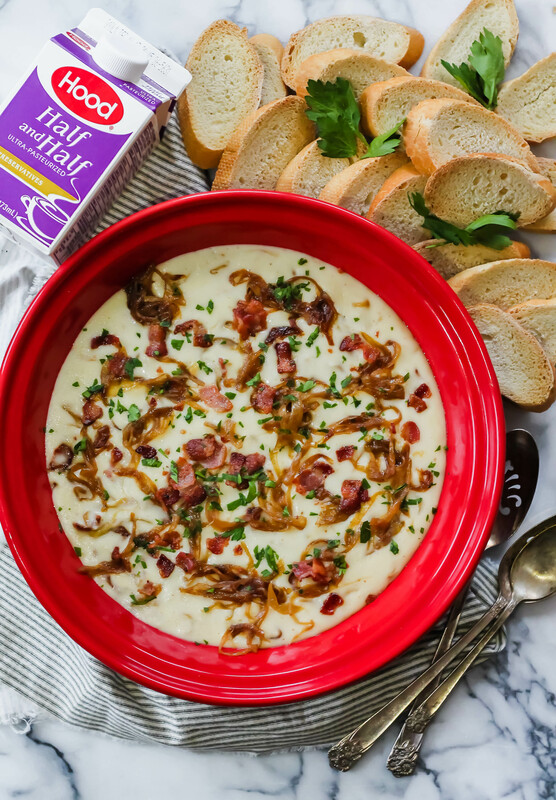 This Brie, Caramelized Onion, and Bacon Dip is creamy, cheesy, and packed with bacon - making it the tastiest and most indulgent cheese party dip! In a large sauté pan, heat the butter and oil over medium heat and place onion slices. To caramelize, reduce the heat to low, toss onions in butter/oil and stir every 10 minutes, until onions become soft and dark brown. This will take about 45 minutes to an hour. You can do this step the day before to save time! In another saucepan, add the chopped bacon and cook until crisp. Remove from pan but leave the bacon fat in the pan. Add the flour and make a roux, cook for 3 minutes. Add the Hood Half & Half and whisk until thickened slightly. Add cheese, nutmeg, and season with salt and pepper. Fold in the caramelized onions and crisp bacon, reserving some for topping. Pour dip into oven safe dish, sprinkle with reserved onions and bacon. Can be served immediately, but if reheating, place in oven for 15-20 minutes until bubbly, serve sprinkled with parsley and crispy bread. To find more holiday party recipes, head over to Hood® Cream website. Remember you can find all Hood® products across New England grocery stores – and if you don’t see it at your local store, ask them to carry it for you! WOW is that a decadent appetizer! I think I’d have a problem not eating it all by myself!